016. TERRA NOVA. Issued by Sanitarium Health Food Company, Auckland, New Zealand (Date?). No. 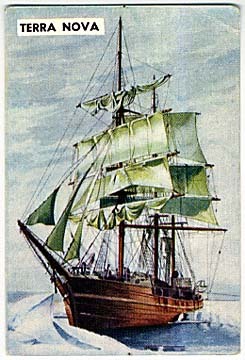 13 in a set of 25 cards titled "Famous Ships in History". Size: 3.4+" x 2.3+". Recto: Color painted view of the Terra Nova beside ice barrier. Title in upper left corner: Terra Nova. Verso: FAMOUS SHIPS IN HISTORY | A SET OF TWENTY-FIVE CARDS | (No. 13) TERRA NOVA | The Terra Nova was sent as a relief ship to Scott's Antarctic Expedition in 1904. Built in Scotland in 1884, she had a gross tonnage of 764, length 187 feet, breadth 31 feet, 4 inches and depth 19 feet. Built of wood, the Terra Nova had a reinforced bow for smashing its way through the ice and was found most suitable for work in the Icefields. On November 26th, 1910, Captain Scott sailed from Lyttelton, New Zealand in the Terra Nova on what was to be his last expedition.